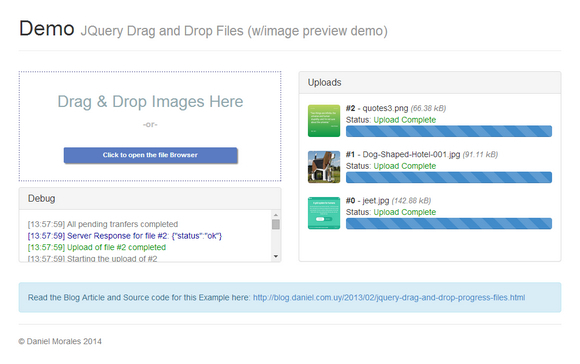 jQuery File Uploader is a jQuery plugin to drag and drop files, including ajax upload and progress bar. The idea for this plugin is to keep it very simple; unlike other options/plugins that mess up a lot with the markup and provide some really ‘hacky’ ways to make it available for prehistoric browsers. The focus will be for modern browsers, but also providing a method to know when is the plugin is not supported; with an easy interface to use on any design you come up. Dual licensed under the MIT and GPL licenses.